Known as the world’s largest public festival, the Munich Oktoberfest is enjoyed each year by more than six million visitors. It runs for 16 days each year — three weekends and the days between — from late September into early October. Fortunately, for those of us who can’t make it to die Wiesn (‘the Meadow’) for the world’s biggest party, each year there are more than 150 Oktoberfests in North America — from New York to Seattle, and from Kitchener-Waterloo to Vancouver. With 16% of the US population and about 10% of Canadians claiming German ancestry, it’s no wonder the annual celebration of German culture, food and drink is such a popular annual event! Search the list below to find an Oktoberfest event near you. The list is sorted alphabetically by state or province. If you would like your Oktoberfest event to be listed on this page, please email us. The Freunde Deutscher Sprache und Kultur (FDSK) German Culture Club has hosted a traditional Bavarian-style Oktoberfest in downtown Birmingham annually since 1969. Southeast Tourism Society listed the FDSK Birmingham Oktoberfest as “One of the Top Twenty Events in the Southeast” four consecutive years, 1986-89. Also celebrating Christmas Markets in December! For more information, visit the Birmingham Oktoberfest site. Strike up the oompah band! Dust off the lederhosen and dirndl! And roll out the root beer keg! Cullman, Alabama, is getting ready for its annual Oktoberfest. The city’s German heritage, tradition and values emerge in full bloom. Come to the Festhalle, center of daily fun, food, music and dancing. The unique Cullman Festhalle is near the center of town and by the Col. Cullman Museum. For more information, visit the Cullman Oktoberfest site. Howze Field Across from Aviators’ Landing on Novosel St. Oktoberfest Celebration German Music, Schnitzel, Bratwurst, Authentic German Beer, Vendors, Games, need we say more. The party of all parties you don’t want to miss!! 334-255-1749. For more information, visit the Fort Rucker Oktoberfest’s Facebook page! A block party celebration that will include brats, of course, live music, authentic Oktoberfest games, plenty of craft ales, selection of fine wines, spectacular raffle basket prizes and fun to help make a difference for a good cause. The proceeds help fund scientific research to find better treatments and a cure for Parkinson’s and support local organizations that guide and serve people with Parkinson’s, their care partners and families. Baehr Challenge Phoenix Oktoberfest site. Oktoberfest is a time of music and merrymaking featuring The Alpiners Band from Vancouver BC., under the direction of Al Pichler. This versatile group plays everything from oompapa to sing-a-longs and modern tunes. The Edelweiss Dancers provide entertainment with the Schuplattler dancers from the Bavarian and Tyrolean Alps. The Silverstar Band also from Vancouver, BC., are known to be quite versatile in their playing as well, from old-fashioned polkas or waltzes to rock music. For more information, visit the the Port Alberni “Europa Club” site. Come and join us for a special Oktoberfest Menu and of course beer and Bavarian Pretzels. Contests include beer stein holding and a pretzel count. We also have gag photography. Four bands will be providing traditional and contemporary music. For more information, visit the Annual Tyrolean Inn Oktoberfest site. For six and a half weekends every Fall a very special extended family comes together in Big Bear for Southern California’s party of the season and you’re invited to join the celebration! The Big Bear Lake Oktoberfest commemorates the traditions of a simpler era. A time when family and friends offered happiness and enjoyment. For more information, visit the Annual Big Bear Lake Oktoberfest site. This festival draws over 40,000 people so come early and expect to stay all day as you visit over 100 arts and crafts booths. Vendors offerings include traditional creations such as jewelry, photography, paintings and wood crafts. Spaten Beer representatives will be pouring an official Oktoberfest beer dating back to 1810 and the days of King Ludwig. German foods, including many types of Bratwurst, plus German potato salad and sauerkraut and red cabbage will delight the taste buds. For more information, visit the Annual Campbell Oktoberfest site. Clayton Business & Community Association invites you to experience Oktoberfest “Munich Style” in picturesque Clayton, CA. Set under beautiful Mt. Diablo, it evokes a feeling of Bavaria. Grab your steins and get ready for 2 fun filled days!street performers, marionette shows, continuous live music featuring The Internationals, traditional Biergarten, great German food and beer, premium California wines, large arts and crafts show, carnival For more information, visit the Clayton’s Annual Oktoberfest Celebration site. Get out your lederhosen and practice your yodeling for the upcoming Cotati Oktoberfest. Wunderbar German food and beer, plus the oom-pah-pah of Karl Lebherz Band. Polka to your heart’s content on our dance floor. La Plaza Park, downtown Cotati at the corner of Old Redwood Hwy. & W. Sierra Ave., under a giant tent! For more information, call the Cotati Chamber of Commerce at (707) 795-5508 or email [email protected], or visit the Cotati Oktoberfest site. Enjoy German food and dance. For more information, visit the Oktoberfest in the Gold Country – Grass Valley site. Live music by the Deutscher Musik Verein, San Francisco and The Edelweiß Band, performances by Almenrausch Schuhplattler and Naturfreunde Schuhplattler, Fahneneinmarsch of the German Clubs (flag ceremony), good German food, Bavarian beer, Californian wine Puppet Show and Children’s Crafts, great raffle and vendors. For more information, visit the German Fest site. Since 1978, Oktoberfest has had its roots right here in Huntington Beach. Complete with German bands imported from Europe, dancing, and imported beers (of course) and tasty German foods from bratwurst to potato salad to hot pretzels and apple strudel, Oktoberfest has something for everyone. Even you can join in on all the fun and even learn the infamous “chicken dance.” For more information, visit the Oktoberfest at Old World Village site. Oakland’s own Linden Street Brewery and Berkeley’s Triple Rock Brewery. For more information, visit the Oktoberfest in the Dimond site. Traditional Oktoberfest with Gemütlichkeit, German food, Pretzels and great raffle prizes. Dance to the music of Tony Raymann and his Edelweiss Band. Entertainment by the Schuhplattler Folk Dancers. For more information, visit the Oktoberfest in Petaluma site. The German-American Societies of San Diego present their annual Oktoberfest with German live bands, foods and beverages, as well as kid’s entertainment. For more information, visit the San Diego Oktoberfest site. Celebrating in the true tradition of Munich’s famed Oktoberfest, the festival will include nonstop music, dancing, singing, and the very best in German food and drink. The world renowned Chico Bavarian Band will headline the stage. For more information, visit the Oktoberfest By The Bay site. Street Fair in Sierra City on scenic Highway 49, located 12 miles east of Downieville at the foot of the Sierra Buttes. Live Oompah Band, German food, Kids’ Entertainment, Raffle. Wear your Dirndl and Lederhosen! For more information, visit the Sierra City Annual Oktoberfest site. Alpine Village is the home of the oldest and largest Oktoberfest celebration in Southern California!Traditional Bavarian fun is supplied by Oom Pah Pah big bands flown in direct from Germany, your belly is sated by traditional German fare, and your thirst is quenched by delicious German beers. We deliver an authentic Oktoberfest to you each and every year…and all within 10 miles of Southern California’s beautiful beaches! For more information, visit the Alpine Village Oktoberfest site. Grab your stein, throw on your lederhosen, and get ready for Denver’s 40th annual Oktoberfest. The festival has truly become a Denver mainstay offering German attractions, music from national touring groups, performances by international dancers, children’s activities, heritage booths selling German goods, splendid decor, an accordion concert, traditional Biergartens, and authentic cuisine. For more information, visit the Oktoberfest on Larimer Square site. The Town of Vail is hosting two full weekends of oompah parties, lively demonstrations and traditional German fare in Lionshead and Vail Village. Festivities include brat-eating and keg-decorating contests, yodeling and alpine horn blowing, and Bavarian dancing. Oktoberfest is six fun-filled days the whole family will enjoy. For more information, visit the Vail Oktoberfest site. Home made Potato Pancakes, German Beer, German Wurst, Sauerkraut, German baked goods, Schuhplattlers & German Musik. Band from Bavaria, Germany: Schwabenmusikanten. For more information, visit the The Hartford Saengerbund German Bierfest site. Home made Potato Pancakes, German Beer, German Wurst, Sauerkraut, German baked goods, Schuhplattlers & German Musik. For more information, visit the The Harugari Oktoberfest site. German specialties include grilled Bratwurst (pork sausage), Weisswurst (veal sausage), Frankfurters, BBQchicken, pretzels and “Rollmops”, a marinated herring served with rye bread. The “Enzian Volkstanzgruppe”, the Bavarian dance group of the Delaware Saengerbund, will entertain at intervals during the festival. They perform in the colorful “Tracht” – the traditional costume patterned after the distinctive style of Miesbach in Bavaria. The men wear “Lederhosen” – buck skin leather pants – the women a “Dirndl” – a dress consisting of several parts: skirt, blouse, vest, apron, shawl, completed with a special hat. German music is provided throughout the weekend for dancing. For more information, visit the Delaware Saengerbund Oktoberfest site. Six days of Gemütlichkeit (comfort in a festive atmosphere), laughter, singing and dancing, along with delicious food and beverages, games and entertainment for the whole family. For more information, visit the Cape Coral Oktoberfest site. Our “Original “Oktoberfest” is one of the largest in the country! Held on ten acres of ground, under our new pavilion and massive tent. Bands from Germany, ethnic entertainment, authentic German food and imported German beer and wine along with arts and crafts, souvenirs and a carnival for kids and adults welcome 30,000 guests over two weekends. For more information, visit the Annual Lake Worth Oktoberfest site. For more information, visit the Oktoberfest German-American Club of Greater Miami site. The biggest Oktoberfest-Party in the Southeast that lasts two months. Located within walking distance of most hotels, Helen’s Festhalle is the spot for authentic German bands, food, beer, and fun. For more information, visit the Alpine Helen Oktoberfest site. Located in the heart of the Village of Amana, the Festhalle, one of Amana’s great barns, has been restored to house Oktoberfest as well as other events. It was built in 1900. A portion of the gate receipts goes to continued restoration. For more information, visit the Amana Oktoberfest site. Oktoberfest is Bavarian entertainment with Polka Bands, a Beer Garden, an Arts and Crafts show and a large Family Style ethnic Luxembourger meal served by Remsenites in Bavarian garb. We invite everyone to visit northwest Iowa and share the good times at Remsen Oktoberfest! Starting with humble beginnings in 1974, Remsen’s Oktoberfest now serves over 2,500 people the last Saturday in October (the weekends always the same). For more information, visit the Annual Oktoberfest in Remsen site. Beer, brats, music and fun at St. Alphonsus´ Annual Oktoberfest, one of the original premier festivals in Chicago! Keeping with tradition, festival-goers can expect homemade bratwurst, the “oompah” of German bands, the music of top area headliner bands, activities for kids (“Kinderfest”), and of course lots of great beer! Held outdoors in a beer garden fashion under a ‘big-top’ tent. For more information, visit the Chicago Oktoberfest site. Our Oktoberfest is a cooperative partnership with the Peoria German-American Central Society and the Peoria Park District, and features German culture with authentic food, music and of course, German beer. We have a heritage tent, a puppet theater, carnival with children activities, plenty of music with dancing…it’s fun for all ages! For more information, visit the Peoria Oktoberfest site. The celebration of Oktoberfest at Lynfred began over two decades ago and continues to be a festival that is remembered by all. Two days of German sing-a-longs, grape spitting, grape stomping, cork tossing and barrel races! Bring your friends, bring your family and bring your appetite! For more information, visit the Annual Lynfred Oktoberfest and Pig Roast site. The Seymour Oktoberfest has everything you’re looking for! From hot air balloon races and a festive parade — to a large flea market and clowns, there’s something for everyone to enjoy. If you’re looking for a high-energy experience, you’ll enjoy the 5k Walk/Run/Wheelchair race, the talent contest and German bands that are scheduled to perform nightly throughout the festival. For a quieter time, check out the baking contest, windows decorated for the festivities and the baby contest. The Oktoberfest also features free entertainment nightly on all three stages. For more information, visit the Seymour Oktoberfest site. Join in the fun with polka music, games, presentations, entertainment activities and wonderful German food. Crafts, old-time demonstrations, rides and games for the kids make this a great family weekend. For more information, visit the Midwest Deutsche Oktoberfest site. MainStrasse Village’s Oktoberfest, one of Southeast Tourism Society’s Top 20 Festivals for September and one of Kentucky Tourism Council’s “Top Ten Fall Festivals”, invites families and travelers from throughout the Midwest to join with local crowds in enjoying the festival. A great mix of German and international foods, music and arts and crafts attracts approximately 150,000 people to this popular festival in historic MainStrasse Village. For more information, visit the Annual MainStrasse Village Oktoberfest site. This Oktoberfest is organized by the German-American Club Gesangverein, Inc. Gebhard Erler, The Kaelins, The Rheingolds. For more information, visit the Louisville Oktoberfest site. Each year, thousands of people come to the Haus to enjoy the traditional German cuisine (everything from Schnitzel to Sauerkraut), dancing in the Biergarten, favorite folksongs and German beer and wine, all part of the annual Oktoberfest celebration. For more information, visit the Deutsches Haus Oktoberfest site. Southwest Louisiana is known worldwide for being home to many people of different cultures and backgrounds. Roberts Cove, Louisiana is a small community nestled in the heart of Acadiana. We celebrate our German heritage, and spotlight it at our annual festival. German food, entertainment, heritage museum, authentic gifts, are just a few of our festival’s attractions. Our clean and fun family environment set us apart from any other festival around. To experience this for yourself, join us for our annual festival. Young or old, our festival will leave you with memories that you will never forget! Join us for a taste of German food, fun and heritage. It is sure to be an experience you will never forget! For more information, visit the Roberts Cove German Festival site. The first weekend in October is time for our German style Octoberfest- one of the biggest in New England. Come enjoy fresh Harpoon Octoberfest beer, German food, and German Oompah music. Prost! For more information, visit the Harpoon Oktoberfest site. Over 30 restaurant vendors, hundreds of street vendors selling artworks, jewelry, vintage clothing, neighborhood side sidewalk sales and HONK bands from around the country! For more information, visit the Annual Oktoberfest and Honk Festival in Harvard Square site. August Vienna celebrates its Annual “Oktoberfest”. Enjoy cold beer, good Riesling wine as well a sit-down authentic German wedding dinner – complimentary hors d’oeuvres and the “Hofbrauhaus Schlachtplatte” & Apple strudel. Dancing all day with plenty of time for Yodeling & the ever popular “Ein Prosit, Ein Prosit…! This is an event for a single person wanting to make new friends or a group of 40! For more information, visit the Annual “Oktoberfest” site. Visit the largest Oktoberfest in New England with Beer and Wine from the German Beer Garden, Potato Salad, Sauerkraut, Sausages and Dancing in the Pavilion. For more information, visit the Boylston Schul-Verein Oktoberfest site. All of your favorite craft beers and perfectly paired wines will be served to highlight the great Beer Hall theme. Baltimore Oktoberfest site. Be sure to mark your calendar for an event rich in tradition and history. Experience the thrill of Oktoberfest in Frederick, Maryland, at the Frederick Fairgrounds. Community Living, Inc. along with the help of The Rotary Club of Carroll Creek and The Fredericktowne Rotary proudly present the seventh annual Frederick’s Oktoberfest 2009! Proceeds will benefit Community Living’s effort to continue to provide support services to individuals with developmental disabilities. For more information, visit the Frederick Oktoberfest site. This traditional eating, drinking and dancing festival takes place the third full weekend of October each year, rain or shine. It features a beer tent, German food (wurst from the purveyor to the German Embassy), oompah band, German cultural activities, juried crafts, colonial living history demonstrators and children’s fun. For more information, visit the Oktoberfest at Schifferstadt site. Amidst horse-drawn hayrides and scarecrow making, festival goers can enjoy authentic Bavarian fare and lively performances. Throughout the festival you’ll find booths representing local merchants, organizations, artists and craftspersons. The Arts Barn Museum Shop adjacent to the Village Green will showcase one-of-a-kind pieces by more than 100 local artists. Kids will also enjoy a full day of pony rides, moonbounces, face painting and many other activities. For more information, visit the Annual Oktoberfest at the Kentlands site. Oktoberfest is Montgomery County Maryland’s flagship Upcounty event at which people from all over come together to celebrate our community and heritage. Germantown Oktoberfest offers a wonderful, fun-filled day of live music and performances, delicious food, kids’ games & inflatables, exhibits by local crafters and businesses, the ever-famous Germantown Oktoberfest Biergarten, and a spectacular display of fireworks to end a perfect day! Germantown Oktoberfest is a non-profit event from which proceeds are donated to local charity that has successfully worked to improve the lives of those living in our area. For more information, visit the Germantown Oktoberfest site. 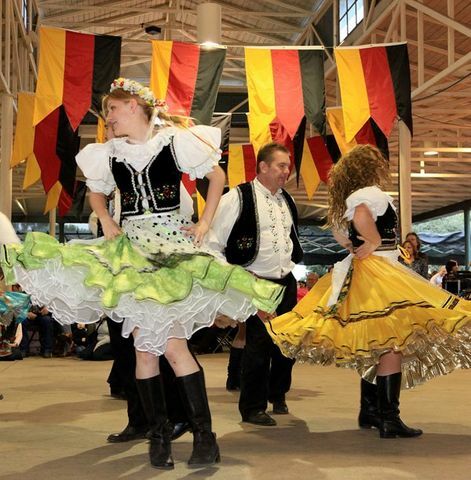 The Augustoberfest Event pays tribute to the area’s rich German heritage and supports scholarships for exchange students to Hagerstown’s Sister City – Wesel, Germany. This exciting event is run by the nonprofit organization, the Augustoberfest Charitable Foundation. For more information, visit the Augustoberfest site. The laughter and fun of Bavaria comes to Ocean City, Maryland! Discover the flavor of an Oom Pah-Pah Oktoberfest! Eat, Drink, and be Merry with schnitzels, wursts, and barrels of bier! Enjoy three full days and two nights of music and continuous entertainment for the whole family. For more information, visit the Annual OKTOBERFEST site. Sixteenth annual Acadia Oktoberfest, Food Festival and Craft Fair. Rated one of the twelve top Oktoberfests in the country by the national brewers magazines. Rain or shine all under giant tents. At Smugglers Den Campground on Route 102 in Southwest Harbor. No dogs allowed please. Call 207-244-9264 or 800-423-9264. For more information, visit the Acadia Oktoberfest & Food Festival site. In 1990, Frankenmuth, “Michigan’s Little Bavaria,” celebrated its first Oktoberfest. The Frankenmuth Oktoberfest celebrates German culture, heritage and love. Our goal is to incorporate as many of the sights, sounds, taste and traditions of the original Munich Oktoberfest as possible. We strive to retain as much of our Bavarian heritage as possible and proudly demonstrate this during the Frankenmuth Oktoberfest. Frankenmuth is the first Oktoberfest outside of Munich to be sanctioned by the Parliament and the City of Munich. For more information, visit the Frankenmuth Oktoberfest site. An autumn tradition, Oktoberfest at Ruttger’s is non-stop activity! Enjoy the Harvest Dinner Show featuring the Concord Singers on Friday night. Saturday’s activities include our Breakfast Buffet and German Dinner Buffet, Arts & Crafts Fair, sales at the retail shops, specials at the spa, picknick, weinstube and biergarten, musical entertainment and children’s activities. Polka the night away at the family dance on Saturday, and wind down with our Brunch Buffet on Sunday. For more information, visit the Twin City Oktoberfest site. This Old World celebration will feature musical entertainment including New Ulm’s famous Concord Singers, German Brass Bands, and of course numerous local and regionally acclaimed polka bands providing all of the German favorites to “oompah, polka, and waltz” the night away. For more information, visit the New Ulm Oktoberfest site. Offering great music, fabulous food and activities for the entire family, the Soulard Oktoberfest is the perfect way to experience the rich German cultural heritage of the area. Historic Soulard is the ideal setting for an Old World Style Celebration. FREE ADMISSION TO OVER 30 MUSIC PERFORMANCES AND EVENTS For more information, visit the Soulard Oktoberfest site. Oktoberfest is sponsored by Copper Village Museum and Arts Center. A fun filled day begins at 10:00am with and arts and craft show at Copper Village, 401 E Commercial St. in Anaconda. There will be a Farmer’s Market in the adjoining park. German sausages, potato salad, kraut, hot rolls and other wonderful food will be available all day. There will be a beer garden and entertainment in Friendship Park. Free children’s craft area. For more information, visit the Oktoberfest Anaconda site. This 10th Annual celebration of craft brewing will again take place on the stadium’s grass field, with beautiful views of Uptown Charlotte, and will featured over 350 beers from over 100 of the finest breweries from across the Southeast and around the world! For more information, visit the Charlotte Oktoberfest Beer Festival site. Founded in 1978, the Triad German Club is a non-profit organized for the purpose of promoting the German language, culture, tradition, and literature in the Triad area of North Carolina. Oktoberfest, at which German Music is played by the Little German Band of Raleigh, NC and which features numerous traditional dances and costumes. For more information, visit the Triad German Club Oktoberfest site. For more information, visit the New Leipzig Annual Oktoberfest site. Come, bring your family and friends! You will have a good time! Enjoy German Roast Pig, Roast Chicken, Schnitzel and Bratwurst. There will be Warsteiner beer on tap, or your choice of wine, mixed drinks, soft drinks and coffee. For more information, visit the German Society Oktoberfest or Beer Corner USA Oktoberfest in Omaha sites. Hillsborough celebrates Oktoberfest at their Annual Schnitzelfest event with live Bavarian Oom-Pah band music and the most authentic German food you’ll experience outside of Germany. Rain or shine, under the tents in downtown Hillsborough, Schnitzelfest is open from 11am to 5:00pm and is sponsored by the Hillsborough Chamber of Commerce. Great food, Vendors & Crafters. Fun for the whole family. Come & Enjoy a Taste of Germany! FREE admission! For more information call the Hillsborough Chamber of Commerce at 603.464.5858 or German John’s Bakery 603.464.5079, email: [email protected] For more information, visit the Annual Schnitzelfest site. This New Jersey town near New York City puts on a Bavarian-themed party at Andy’s Corner Oktoberfest. For more information, visit the Andy’s Corner Oktoberfest site. Smithville celebrates Oktoberfest, which features a juried craft show, German food, and beer. For more information, visit the Oktoberfest in Smithville site. Oktoberfest includes three microbreweries: Santa Fe Brewing, Tractor Brewing, and Durango Brewing, food vendors, arts and crafts vendors, German “Oompah” Polka music, contests, and activities for kids such as a sculpture painting contest and a root beer garden. For more information, visit the Red River, NM site. It’s the 27th annual Oktoberfest with Live Music, Kid’s games, German foods, dancing and family fun. For more information, visit the Ruidoso Oktoberfest site. Join us for the biggest party of the year as we kick off our Oktoberfest with a celebraty keg tapping. The party will go on with celebrety keg tappings every weekend. Siegfried and Roy will tap the first keg at the Hofbräuhaus Las Vegas, a replica of the Munich original. For more information, visit the Oktoberfest Kick Off Hofbräuhaus Las Vegas site. and Much More..one hour ferry ride up the Hudson River For more information, visit the Bear Mountain Oktoberfest site. For more information, visit the Annual New Generation German-American Club Oktoberfest site. The Annual Oktoberfest will take place at the Lower Lodge of Belleayre Ski Center in Highmount. For more information, visit the Annual Oktoberfest in the Catskills site. Our Oktoberfest features authentic German and German-American entertainment in the beauty of the northern Catskills in autumn. Our modern celebration of the harvest features a farmers market, plenty of vendors, free crafts and pumpkin painting for the kids, and much more. Free Admission makes it an affordable, fun time for all ages. For more information, visit the Hunter Oktoberfest site. The Annual Oktoberfest in Irondequoit, NY (a lovely lakeside suburb of Rochester, NY) features two weekends of fun, food and entertainment! You can dance, sing, and dine with the finest International Oktoberfest Bands. In one 40,000 sq. ft. tent. Visit the Haus of Bavaria for quality merchandise at affordable prices, be it a stein, pies, hats or clothing. For more information, visit the the Irondequoit site. Traditional German fall festival with German bands, dance groups, singing societies, cultural displays and exhibits, as well as authentic German foods and goods. Folk dance instruction daily. Sponsored by German-American Society of Central New York. For more information, visit The Great Syracuse Oktoberfest site. The Labor Day Oktoberfest takes place at the Cuyahoga County Fairgrounds in Berea. Join us for four exciting days of authentic German Food, Beer, and Entertainment with Local and Regional Musicans and German Dance Groups. For more information, visit the The Labor Day Oktoberfest at the Berea Fairgrounds site. Germania Society’s Oktoberfest with German Foods and Beverages, Dance and Music. For more information, visit the Cincinnati’s Original Oktoberfest site. Oktoberfest-Zinzinnati showcases the rich German heritage of Southwestern Ohio, as well as tasty samples of German-style music, food and beer. First held in 1976, the event has grown to be North America’s largest Oktoberfest with over 500,000 people attending each year. For more information, visit the Oktoberfest Zinzinnati site. German Village Oktoberfest is a celebration that blends a time-honored German festival with the vitality and charm of a thriving urban neighborhood. Oktoberfest features traditional German polka as well as various other styles of music, a variety of authentic German food and other festival favorites. Don’t miss Marketplatz filled with artisans and unique shops. Join us at Grant & Livingston for “one of the top 100 events in North America!” Be sure to check our website for updates, price breaks, entertainment, and special offers. For more information, visit the German Village Oktoberfest site. Akron’s best kept secret. For entertainment will be local German bands and traditional folk dancing. We have imported crafts and collectibles, and Sunday for kids fun games and inflatable jumping. Enjoy authentic German cooking, quench your thirst with different imported or domestic beers, wine or non-alcoholic beverages, and for dessert have some German pastry. For more information, visit the German Family Society of Akron Oktoberfest site. The Oktoberfest, which draws over 80,000 people to the Village, emphasizes the community’s rich German heritage. The people of Minster feel that the Oktoberfest is not just an event; It’s a feeling, a spirit, a happy mood that conveys the warmth and friendliness of the community. For more information, visit the Minster Oktoberfest site. The Chalet at Oak Shade Grove is a barrier-free hall, designed in Bavarian-style architecture, is located within G.A.F. Park. The Park is the home of the German-American Festival and sits on a wooded twelve acre park in Oregon, Ohio (Toledo area). It is one of the area’s most beautiful settings, tucked away in a park with flower beds and well manicured lawns. For more information, visit the Chalet at Oak Shade Grove site. The annual Oktoberfest is held at Choctaw Creek Park, in Choctaw Oklahoma. From the delicious foods, prepared by “Old Germany Restaurant”, imported and domestic beers, as well as a variety of entertainment we bring you the largest and funniest fest in the greater Oklahoma City area. There will be traditional folk dancing, much singing and schunkeln, authentic costumes and a variety of German food that will transpose you to a continent of old fashioned charm that was only known to those who have ventured to the famous beer halls of Germany. For more information, visit the Annual Oktoberfest at Choctaw Creek Park site. Bands direct from Germany, Austria and the U.S. provide non-stop entertainment each day of the festival. Kids and families enjoy the fun of Das Jugendzelt. Free arts & crafts, entertainment and a carnival. There’s a menu—German, European, or just fun food—for every appetite. And, a great selection of beverages. For more information, visit the Tulsa Oktoberfest site. Canada’s great Bavarian Festival. Since 1969, the Festival has grown from a weekend event in one Festhalle, to a nine day, internationally famous Festival that attracts over 700,000 participants. It includes a variety of different events, such as “The Oktoberfest Ball” and the “Oktoberfest Idol”. For more information, visit the Kitchener-Waterloo Oktoberfest site. It is Oregon’s largest folk festival. Traditional Biergarten, Weingarten and Alpinegarten, over 30 musical groups featuring the Original Donaumusikanten from Germany Courtesy Lufthansa, free Kindergarten with rides and shows and over 60 Alpine food chalets serving a wide variety of foods. For more information, visit the Mt. Angel Oktoberfest site. The Sandy Oktoberfest, unlike many others, is truly a family event where families; seniors and singles can find fun and entertainment. Under the large tent with live music. Music by Al Meixner Trio, Kapella Fellas, The Adlers and Walt Groller. Beer, food and dance. For more information, visit the Sandy Oktoberfest site. Experience a European tradition featuring “oom-pah” bands, pig roast, and great beers. For more information, visit the Annual Oktoberfest site. The pride of the Chamber, the annual Oktoberfest that was conceived by the Board and visualized as a local celebration, drew, after its first year, the attention of persons in Western Pennsylvania and beyond. Now known as the Pennsylvania Bavarian Oktoberfest, this 3-day September event draws thousands of visitors from all over the country to Canonsburg. Growing each year, the Oktoberfest places Canonsburg on the map as one of the premier Bavarian festivals in the country. For more information, visit the Pennsylvania Bavarian Oktoberfest site. Lancaster’s oldest traditional German Oktoberfest under the pavilion and big tents. Rain or Shine. Nonstop musical entertainment and gemütlichkeit. German Food & Drink – Pig Roast – German Song & Dance – Two Playgrounds for the Children For more information, visit the Lancaster Liederkranz German Oktoberfest site. You don’t have to travel to Munich for real German Oktoberfest fun. Here on the North Side, the Munich-based Hofbrauhaus chain pulls out all the stops for the city’s best and most authentic Oktoberfest. For more information, visit the Oktoberfest at Hofbrauhaus site. Oldest & largest Oktoberfest in Eastern Pennsylvania. Free Admission. Parade, German dancers, Liederkranz singers, Kinderplatz, beer-tapping ceremony, authentic German food, continuous German music. For more information, visit the Reading Liederkranz Oktoberfest site. This exciting event will take place in Greer’s historic downtown on beautiful Trade Street. The focus for this event is Germany with flags from Bavaria featured throughout the street in hopes to transform downtown Greer into a Bavarian Hamlet. So, don’t forget to wear your lederhosen and dirndl! For more information, visit the Greer Station Oktoberfest site. You’re invited to experience Gemütlichkeit at the 30th Annual Walhalla Oktoberfest! German banners herald the Oktoberfest season as everyone joins in the festival. Each year, the festival is held at Sertoma Field (located on Highway 183), and features hot air balloons, skydivers, crafts, lederhosen, and carnival rides, as well as fantastic food such as wurst and kraut, and authentic German music and dancers. For more information, visit the Walhalla Oktoberfest site. Oktoberfest with Live Music, Kid’s games, German foods, Biergarten and family fun. Great German Food: Pork Schnitzel, Kasseler Rippchen(Smoked Pork Chop), Bratwursts, Knackwursts, Weisswursts (White Sausage). Domestic and Imported Beverages. For more information, visit the Crossville Oktoberfest site. An authentic recreation of the Munich Oktoberfest featuring more than 30 hours of continuous family-oriented entertainment. German entertainers in authentic German costumes perform traditional German folk dances, schuhplattling, folk songs, ompah music, sing-a-longs, yodels and more. A special “Oktoberfest” Lowenbrau Oktoberfest Beer is served along with several types of German sausage, sauerkraut, strudel, giant pretzels and more. There are carnival rides, midway games, children’s entertainment, petting zoo, 5K run, pony rides and more. For more information, visit the the website of the city of Addison site. Fredericksburg, Texas, celebrates its German heritage through Oktoberfest. Oompah at its best. German music, food and drink, arts and crafts, children’s area and family fun. OKTOBERFEST is a colorful, festive celebration of Fredericksburg, Texas’ German heritage. OKTOBERFEST has become an annual tradition around the world. OKTOBERFEST is a community event of family entertainment featuring two stages and two tents with continuous oompah music, a German Bier Tent, arts & crafts, “Kinder Park” a fun area for children, and Oktoberfest Vineyard area, plus delicious food and drink … all weekend long! For more information, visit the Fredericksburg Oktoberfest site. Historic downtown Galveston will again come alive the last full weekend of October when the annual Island Oktoberfest kicks off Friday evening. The island’s premier fall festival- filled with great music, authentic German food, libations, outstanding arts, crafts, and hand-made gift booths; a lively auction, great raffle, children’s games, and much more – will be held on the grounds of and streets adjacent to First Lutheran Church, 25th and Winnie. Admission is free! Attendees are encouraged to dress in authentic German costumes. For more information, visit the Annual ISLAND OKTOBERFEST site. McKinney, Texas meets Bavaria as McKinney Oktoberfest comes to life again in Historic Downtown McKinney. Germans have a special word – Gemütlichkeit – suggesting a warm atmosphere of open and generous hospitality, and that is how we welcome families and friends during this two-day event in Historic Downtown McKinney. We look forward to showcasing our diversity with this cultural celebration that reflects the many contributions of our German immigrants who settled in Texas. Guests can enjoy authentic German beer from local brewery Franconia, wine and all the German cuisine you would find if you were right in the middle Munich. The kiddos have a ball at Oktoberfest with interactive activities and offerings including face painting, a petting zoo and arts and crafts of all types. For more information, visit the McKinney Oktoberfest site. Join us at the annual “Salute to Sausage”. You don’t have to know how to spell gemuetlichkeit to have a good time at Wurstfest! Come enjoy great music, good fun and many special events. It’s the Munich Oktoberfest, Texas Style! For more information, visit the Annual WURSTFEST site. A taste of the Fatherland! Come to the Beethoven Halle & Garten to celebrate the ultimate German festival! Music, food, and dancing will put you in the spirit! German foods, including Bratwurst, Reubens, Potato Pancakes, etc, will be available for purchase. And to fill your stein, we offer many German wines and beers, their American counterparts, and a variety of soft drinks. For more information, visit the Oktoberfest San Antonio – Beethoven Maennerchor site. Oktoberfest is a three day arts and crafts festival. We normally expect around 50,000 people. Attendees can enjoy shopping with the over 100 arts and crafts vendors, a variety of great food, kids area and fabulous live entertainment. This year will mark the eighth annual Southlake Oktoberfest. This weekend is a ball of fun that you won’t want to miss! For more information, visit the Southlake Oktoberfest site. For more information, visit the the homepage of the Town of Lovettsville, VA.
A celebration of Fall with Toasting, Feasting and Music! Entertainment by a German Oompah Band. For more information, visit theOktoberfest at Mountain Lake site. Celebrating the Germanic history of the Shenandoah Valley, GermanFest will feature both historic and contemporary educational and cultural activities. Relax in the beer and wine garden; sample German (or American) food; enjoy live entertainment including a German band and costumed dancers; watch period skill demonstrations; listen to historical presentations; visit art and craft fair vendors; children’s activities; and more! Stowe’s Jackson Ice Arena will be transformed into a Bavarian village for this annual celebration of harvests and fall foliage. From oompah bands to authentic German foods to freshly brewed Vermont beers to pumpkin painting and puppet theatre — there’s something for every “villager” — young and old. For more information, visit the Stowe Oktoberfest site. There will be live music, dancers, and entertainment. Included in admission is a beer stein or wine glass. For more information, visit the Annual Demming Log Show Oktoberfest site. Like the Oktoberfest in Munich, the Fremont Oktoberfest would not be true to its name if it were not complete with a constant flow of great beer. Enter the Stranger Microbrew Garden and you will experience something like never before. With over 35 breweries pouring over 70 beers, for those 21 and over this is an experience you cannot miss. New this year is a Buxom Beer Garden within the Microbrew Garden featuring full glasses of beer. Complete with a rockin’ music line-up on the Adobe Main stage the Oktoberfest in Fremont packs all the fun of the 16-day celebration into one happening and unbelievable weekend. Don’t miss out on what USA Today considered one of the Top Ten Oktoberfests in the World! For more information, visit the Fremont Oktoberfest site. Our very first Oktoberfest was held in October 1998 which was attended by about 400 people. The next year about 1700 people attended the festival, and a band was brought in from Germany. The festival continued to grow each year and in 2003, a second weekend was added and two bands were brought in from Germany in addition to many performers from the US. By 2005 attendance had grown to 10,000, and the Leavenworth festival was ranked as one of the top Oktoberfest celebrations in the country. What started 9 years ago as a single weekend of festival has grown over the years. Beginning back in 2006, Oktoberfest operates 3 full weekends of fun filled activities for the whole family. For more information, visit the Leavenworth Oktoberfest site. Grab your stein, pull up your lederhosen and get ready to celebrate oktoberfest like never before! This festival features entertainment for the whole family: non-stop traditional and contemporary German entertainment on two stages, a Root Beer Garden for kids, Hammerschlagen and other German festival games, authentic German cuisine and of course, a large Munich-style Biergarten! For more information, visit the the Oktoberfest Northwest website site. For more information, visit the Oktoberfest of the Austria Club of Washington site. Since 1981, Octoberfest has been bringing people to downtown Appleton in the spirit of community pride and celebration. Thanks to your support, Octoberfest is able to provide a fundraising venue to many local not-for-profit organizations. Many of the groups say Octoberfest is their largest fund raiser of the year! Plus, Octoberfest has been able to give grants to the Appleton Police and Fire Departments, Appleton Art Center, Appleton Downtown Incorporated and the Fox Cities Performing Arts Center. For more information, visit the Appleton Octoberfest site. Enjoy a weekend of Oktoberfest fun at the beautiful Northern WI State Fairgrounds located just off of HWY 124 N in Chippewa Falls. Authentic German food and beverages, 4 stages featuring a variety of entertainment, and family activities for all ages. Bring your appetite and dancing shoes. For more information, visit the Oktoberfest in Chippewa Falls site. Authentic music & dancing, ethnic food, bakery, beverages, children’s games, museum tours, silent auction, wood carving, folk painting, bake sale. Free admission & parking. For more information, visit the Annual Germantown Hunsrücker Oktoberfest site. BAVARIAN OKTOBERFEST sponsored by the United German Societies on Friday, Saturday and Sunday. Heidelberg Park behind the Bavarian Inn, 700 W. Lexington Blvd., Glendale, Wisconsin. Traditional Bavarian Schuhplattlers, German beer and food, German music, Weingarten, Children’s playground and much more. For more information, visit the the website of the Wendlstoana at the Bavarian Inn site. For more than 40 years, this blending of the German Oktoberfest with Americanized style has been a happy one. Parades, pageantry, royalty, brew, bratwurst, and world famous entertainment has made La Crosse’s very own Oktoberfest one of the finest in the nation. For more information, visit the La Crosse Oktoberfest site. Few cities wear their German heritage more conspicuously than Milwaukee, whose massive stone City Hall is one of the best examples of German Renaissance Revival design in the U.S. Milwaukee’s Oktoberfest is celebrated on the shores of Lake Michigan every Friday and Saturday in September, following Labor Day. An Alpine pavilion seats up to 2,000 people, who are regaled by German brass bands and German dancers. The festival gears itself to families, like the German original, and the $5 admission makes it one of the more economical versions around. Know before you go: Although the city’s famed Miller Brewing is now part of Coors, tours of the original brewery are still offered daily, except Sunday. For more information, visit the Oktoberfest Milwaukee site. Family, friends, neighbors, and having a great time at the beginning of autumn, is what Plymouth Oktoberfest is all about. The 6th Annual Plymouth Oktoberfest will be held at the Plymouth Arts Center, Friday and Saturday. There’ll be plenty of “Gemuetlichkeit,” (good cheer) to go around, and admission is free! The event will be held rain or shine in the Oktoberfest tent and garden located directly behind the Plymouth Arts Center. German and American food and desserts will be served, along with a biergarten featuring German and domestic bier. For more information, visit the Annual Plymouth Oktoberfest site. An afternoon of dancing, singing, fun & gemütlichkeit in an atmosphere reminiscent of Old Bavaria! The Bavarian Dance Club of Washington, DC and The Edelweiss Band will perform. Colorful costumes & craft exhibits. For more information call (304) 876-2551. For more information, visit the Bavarian Inn Oktoberfest site.